Is your kitchen counter not quite bright enough for the task at hand? 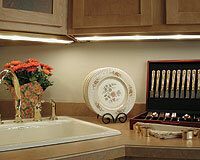 Try undercabinet lighting to illuminate your kitchen chores. Available in low and line voltage, puck lights and strips, modern undercabinet lighting will put brightness right where you need it when you need it. Undercabinet lighting comes in a wide range of sizes and finishes to complement any décor, and is generally easy to install.